No, I haven’t gone crazy. Let’s just get that out of the way. I know what you’re thinking – “She’s gone off the rails. This obsession with Greek yogurt is getting a bit ridiculous.” I know how odd this combination sounds, and I was actually suspicious of it myself. I first encountered it online about a year ago, and dismissed the recipe as something that sounds good in theory, but probably tastes truly strange. And then the assault began. It seemed like everywhere I turned, there was the recipe again, taunting me. I swear at one point, I must have seen it four times in a week. And it started to feel like the universe was asking me to make pasta with yogurt sauce. I reluctantly bookmarked it. And the very next day, opening my pantry to find most of the ingredients staring me in the face (and obviously, there was Greek yogurt sitting in the fridge. Do you not know me yet? ), I decided to try it out. Ohmygod, people. That’s all there is to say. This tastes so completely unexpected, like the best alfredo sauce, only without the cream. Or the parmesan. Or the butter. Or the 5000 calories. The marriage of caramelized onions and tangy yogurt becomes something totally more interesting than it has any right to be. I added some spinach (because I can’t resist tossing it around willy nilly), and some chili oil to give it a touch more pizzazz. But this recipe is genius in every way. Put your doubts aside, and just do it. Bring a large pot of water to boil with plenty of salt. Meanwhile, heat ¼ cup of the olive oil or medium heat and add the chopped onions. Season with salt to taste, stir and cook until soft and well browned, about 20 minutes. Set aside. In a small saucepan, simmer the remaining olive oil along with the pine nuts, chili flakes and paprika. Stir occasionally until the pine nuts turn golden, 3-5 minutes. Cook the pasta until a little more than al dente (it should be a bit softer than usual, without much of a bite, but not really overcooked). Add the spinach, turn off the heat, and drain the pasta and spinach in a colander, reserving about ½ cup of pasta water. Now bring it all together. In a large bowl combine the greek yogurt with about ¼ cup of the reserved pasta water, adding more if needed to thin it further. 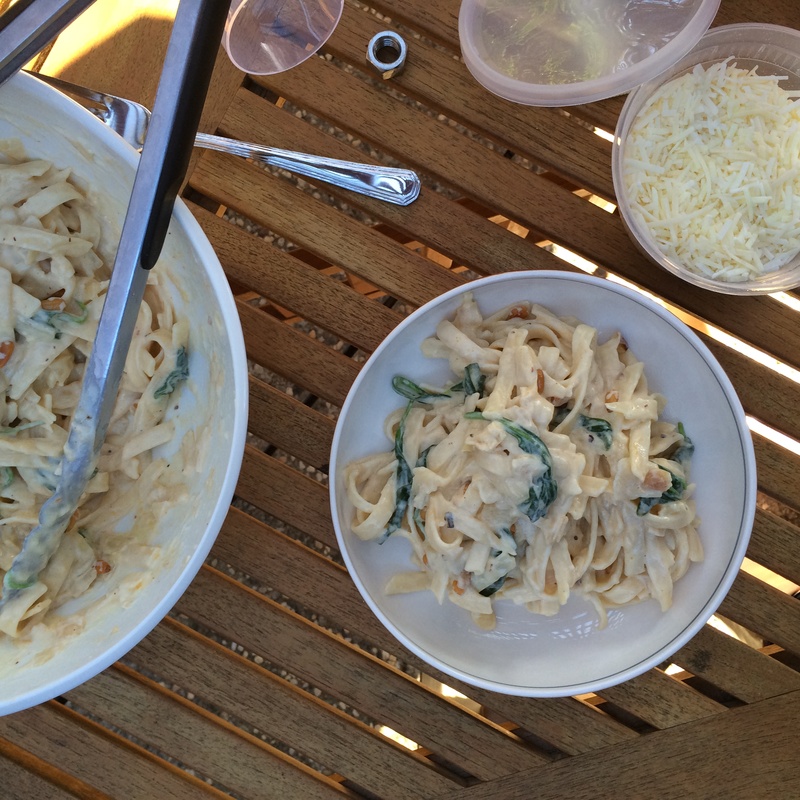 Toss the drained pasta and spinach with the yogurt mixture. Add the onions and the pine nut-chili oil. Toss to combine. Taste for salt, and add crushed black pepper if desired. Serve with grated cheese and ponder all that is good in the world.